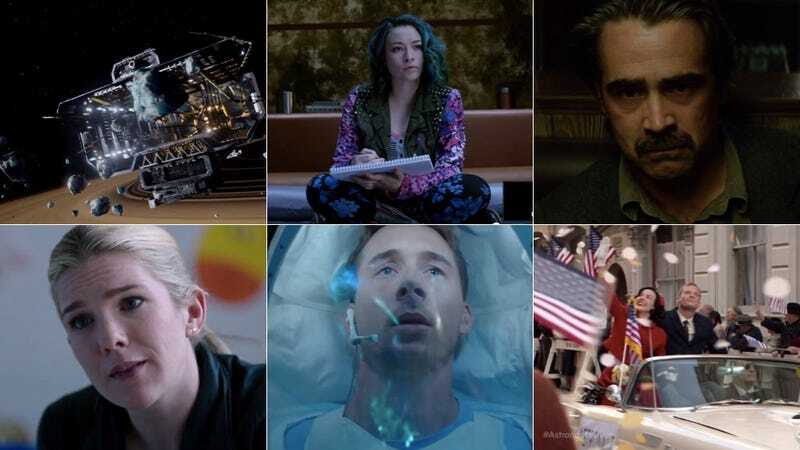 Avoid the hot, hot burning sun of the summer by staying indoors with all this great new supernatural and science fiction TV — including The Whispers which had better be the best new thing ever or we’re flipping tables, plus spaceship shows! Game of Thrones, Orphan Black, The Messengers, iZombie, and Salem. All your supernatural favs return for another season of Penny Dreadful. Eva Green returns as Vanessa Ives and she’s using her “curse” to her advantage. Plus a few new monster appear to be joining her. Goodness, this series is pretty and bloody, and also pretty bloody. M. Night Shyamalan’s version of Twin Peaks, Wayward Pines, is weird as hell. Matt Dillon plays a Secret Service agent who winds up trapped in Wayward Pines after following a missing person’s case to this quiet town. But once he’s there, he can never ever leave. Beauty and the Beast is back and hail, hail, the gang’s all here. Plus, Vincent and Cat are back and making cutie pie eyes at each other (and sometimes scary Beast CG eyes). You know, the regular. This new series almost slipped through the cracks on us. Behold Between. The main character is Wiley Day and (according to the synopsis) she’s a pregnant teenage preacher’s daughter who lives in the small town of Pretty Lake. Sounds like a standard drama, until you add the twist that everyone over the age of 21 dies in this town in the pilot due to a mysterious disease. Sign us up. Hands down the most terrifying trailer of the entire TV season. Little kids are being manipulated by real-life imaginary friends to act out deadly deeds, like detonating homemade bombs or attempting to accidentally kill their parents. It’s spooky. Oh, and it stars Lily Rabe, who is just a battle axe of talent. Last we saw of Bryan Fuller’s Lecter, he was boarding a plane to France with Dr. Du Maurier. What wonders await the world’s politest cannibal? The exceedingly ambitious, globetrotting series the Wachowskis claimed they filmed a live birth for is finally debuting. And we’re still not sure what to make of it all. The premise is expansive, but the talent is real (the two-some also teamed up with Babylon 5 creator J. Michael Straczynski to co-write and produce). Return to the wild, wild alien west in Syfy’s Defiance. This series looks like Desperate Housewives meets The Right Stuff but with more red lipstick. The producers of Orphan Black made a series about space bounty hunters. Sure! Just sit right back and you’ll hear a tale, a tale of a fateful trip that started after everyone died and now we all live on a boat because of the government. The first episode of the new series will be two hours. That’s two hours of McSteamy Captain. The whole new mustache-centric cast of True Detective has a whole new crime to solve. Vince Vaughn is a big time showboat criminal; Rachel McAdams is a sheriff with an attitude who doesn’t jive with cop partners Colin Farrell and Tim Riggins. We really don’t know much, but we know we will be watching. The two-hour premiere will make you all ask: Why is this show still on? It’s the final countdown! This is it, the end of Falling Skies, the farewell swan song. And we have absolutely no idea how this series is going to attempt to tie all these plot lines together. The gorgeous teens return to their lives of Teen Wolfing. But honestly, you should all be watching this show because after the first season it really got damn good. Super self-aware, ultra-meta Wes Craven franchise Scream is coming to the small screen. Looks like it’s more of the same: pretty people getting cut up in ugly ways while less attractive people editorialize about violence and film. Sold. Now with Jeffery Dean Morgan and David Morrissey! Watch this if only to read Lauren Davis’ takedowns the next day. The angel show is back! Remember the wacky scifi series set in a world where angels went to war with humans and then humans decided to move to Vegas and reboot the feudal system based on logos of the surrounding hotels? This show is B-A-N-A-N-A-S, and highly watchable if you’ve gobbled up a ton of children’s Tylenol and codeine. It’s great. Will they or won’t they, but with science! TV Movie - Sharknado 3: Oh Hell No! Sharknado 3: It’s not like you had anything else planned on the 22nd of July. The absolutely addictive reality TV series about makeup artists competing by creating monsters and creatures that go bump in the night. Seriously, I hope this show runs for 22 seasons. That show about Sean Bean is back. The Walking Dead spinoff doesn’t have a set date but it will debut this summer, set in sunny Los Angeles and starring a whole new pack of walker survivors and a whole new pack of drama. The first season ended with a lot of family problems for Eph, and a brand new vampire revolution for Gus. If you don’t think The Strain season 2 can get any darker, think again. We’ve read ahead in the books. Also, maybe this is the year Eph will shave his head, because that wig is the real abomination in the series. Susanna Clarke’s wondrous fantasy novel about two nineteenth century gentleman who discover magic will be adapted for BBC America by Peter Harness. And Bertie Carvel and Eddie Marsan as Strange and Norrell, respectively. Look, we know this is extremely wishful thinking, but we deeply want this series to just come out already. If we had to bet, Syfy’s television adaptation of The Expanse (written by Daniel Abraham and Ty Franck) will be great. The fairly serious drama is set in space and follow Detective Miller as he looks for a missing person in a space colony. But really it’s waaaay more complicated than just that and endlessly intriguing. We’re very, very excited about this one, however we have no idea when it will hit, so we’re just hoping it’s the summer. HBO has been seriously mum on the second season of The Leftovers, and we really need this series to fill our lives with a calm sort of dread.